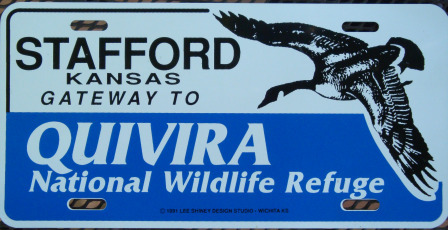 Being only 12 miles southwest of the refuge headquarters, Stafford has been officially designated as the Gateway City to Quivira. This refuge is considered a "Wetland of International Importance" and has been listed as such by the Ramsar Convention. The wildlife refuge consists of 22,000 acres of native grassland, prairie and salt marshes. It is part of the national flyway for migratory birds and attracts rare birds such as the snowy plover, least tern and whooping cranes. Quivira is home to over 300 species of birds and also shelters many different mammals, reptiles, amphibians and fish. This wildlife refuge is a top location for photographers, birdwatchers, hunters and explorers. The Gateway City of Stafford is always close by to provide food, fuel and lodging to those exploring the same marshlands that were originally hunted by the Quivira Indians. The refuge proper is open daily from daylight to dark while the visitor's center is Monday-Friday 7:30 a.m.-4 p.m. From Stafford, the nearest entrance to the refuge is six miles north, six miles east and then one mile north. The visitor's center will also be found that this entrance. 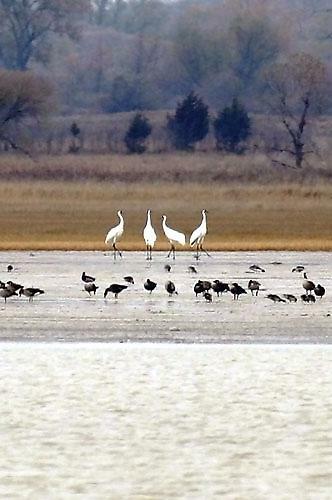 Read about the Kansas Wetlands and Wildlife Scenic Byway.